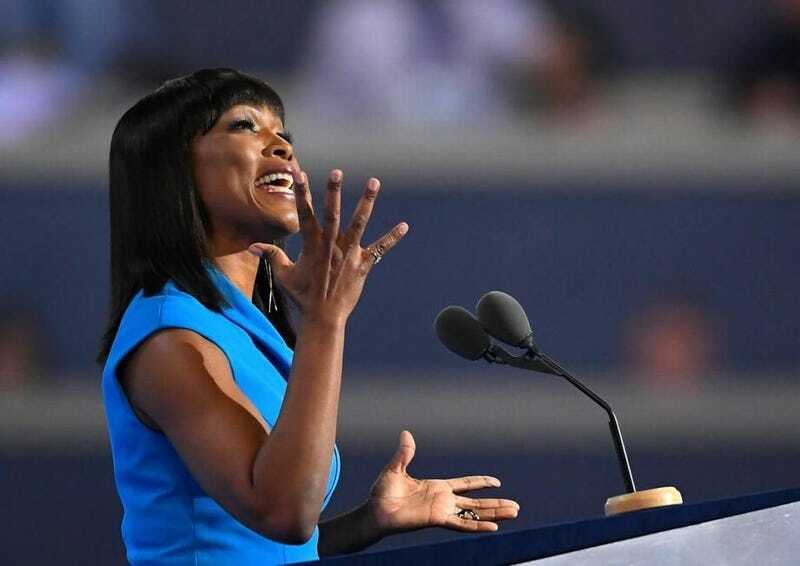 Angela Bassett has been #WithHer since Hillary Clinton announced her run for president, so it wasn't a surprise to see the award-winning actress speak during Wednesday night's Democratic National Convention. Bassett spoke about the need for gun control, while remembering the victims of the Charleston, S.C., Emanuel African Methodist Episcopal Church shooting that left nine people dead. She called out the names of all of the victims, including the church's pastor and a South Carolina state senator, the Rev. Clementa C. Pinckney. “Since the massacre at Charleston’s Emanuel AME Church, more lives have been destroyed by gun violence, and hatred still threatens to tear us apart. After Charleston, Hillary Clinton challenged all of us to turn our grief into action. We have to do that,” Bassett said. "And I can tell you that the city’s soul is on fire. That soul burns with resilience. It fuels their resistance. It brought down the Confederate flag, and it brings the Charleston community closer together every day," Bassett said, recounting her visit to the church earlier this year.